This useful trick can help you to book gigs in your city! Take the “back way” in! Getting a shoe in the door, as a musician, is a very challenging part of what we do. There are so many musicians trying to gain a spot on the rosters of venues everywhere. When it comes to how to find gigs it’s super important to be persistent and to not quit. “Who we know” (so our connections) is often one of the best ways to be hired at a venue. But what if there’s a venue that you want to play in that you have no connections to? I’ve discovered a way to approach venues and be useful to them before even asking for a gig. As always my knowledge is your knowledge! I figured this out while living and playing music in Scotland. Now 99.99% of the time I perform gigs that pay X amount of dollars for a determined amount of time. Exposure doesn’t cut it when you are trying to pay your bills with music. After finding a bunch of good gigs in Edinburgh I started trying something else. The farmers markets did not pay me to perform, but they offered me a spot to play where I knew there was a ton of foot traffic. The manager explained that they can’t pay me but that I can leave my guitar case open and that musicians usually make a lot of tips. The farmers markets happened during the daytime where I usually didn’t have any bookings. I figured, “Alright, I’ll give this a try and see if I like it”. I loved it. The marketplace was vibrant, full of people enjoying their weekends, eating delicious foods, drinking aromatic coffees, trying vegan specialty items, etc. There was so much going on and it was great getting to know the vendors. I ended up making pretty decent money (usually between £80-100.00 which I would not have made if I had decided to simply stay home). On top of this I was handing out business cards and was able to book a few private parties for both vendors and guests of the market. The merchants would also give me free foods like cheeses, breads, salads, meats, sweets, etc. I can’t say enough good things about playing the market. The downside was that it rained a lot in Scotland and it would be pretty slow at the market on a rainy day. But as I was pretty busy with actual paying gigs I didn’t mind taking that chance most times. 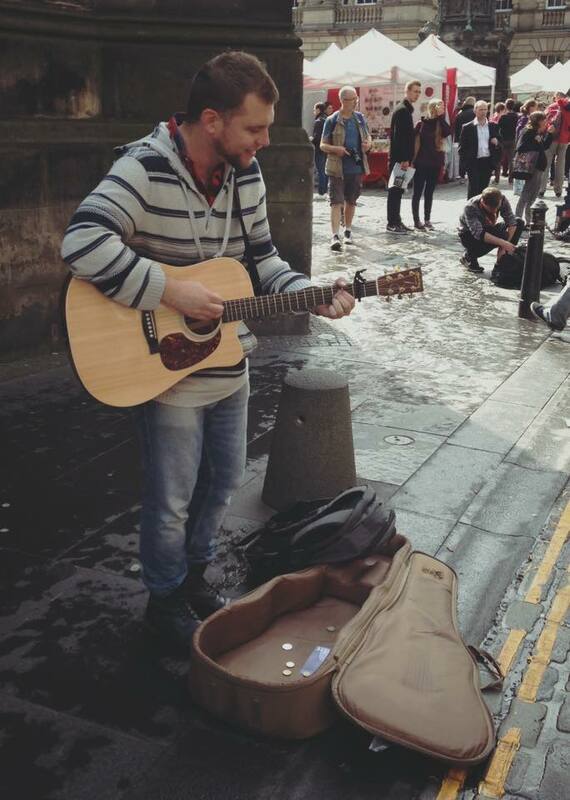 As you can see by my performance schedule I still busk at marketplaces (and love it)! So how does this equal learning how to find gigs? This brings me to when I found this “back way” in to perform at venues. From “busking” at the market I had a bunch of change, £80-200 a week sometimes. I wanted to use the money I made but didn’t want to pay in coins. On my way to the bank to deposit the coins I passed by a local pub. I wanted to perform at this pub and never really had an “in”. They weren’t too busy because it was the early afternoon. I decided I’d ask the pub if they wanted to trade my change for paper notes. The manager behind the bar was delighted to have the change since bars always need change and I saved her a trip to the bank. As we counted my coins we chatted. I knew they had live music in there very frequently so I mentioned “ya, I made this money playing music at the market on the weekend, these were my tips”. I was able to introduce myself as a musician while offering something of value to the pub. It’s great to go to a venue and ask for a gig. You might get a good response or you may get shot down. Using this trick really gotten me a shoe in the door though. Offering something of value to the venue’s manager allowed me to establish a great rapport. It wasn’t long before she booked me in to perform. She also spoke about me with some of her friends who were managers at other pubs. I was booked in to play paid gigs there as well. Maybe this method can help you! That’s how I discovered this method. I’m not saying you can only do this if you busk, that’s just how it worked out for me having that link to the market. I’m not really a busker, as I’ve mentioned, but I was able to use the change I made busking to legitimize myself to a venue. This resulted in me being hired in as a performer. Whether you get change by busking, or from tips at paid gigs, or by saving change, it’s all the same. I applied this trick to a couple of other bars and it worked every time. It even worked in places where live music wasn’t really a thing. the manager/staff would recommend other places I could go looking for work. They even put in a good word for me. Providing something of value sets you apart from the competition who is going in “asking for something”. If you go in “giving something” you stand a chance to have that “giving” reciprocated. I hope this articles has helped you to learn how to book gigs new places as well as forge some new relationships in your city’s music scene. Good luck!